Some more images of our bamboo TrotBot demo at the maker faire can be found here, and you can find an overview of our "Ver 0" wooden scale up here. While the active heels and toes we added to LEGO TrotBots improve performance at small-scale, they are harder to add at large-scale. 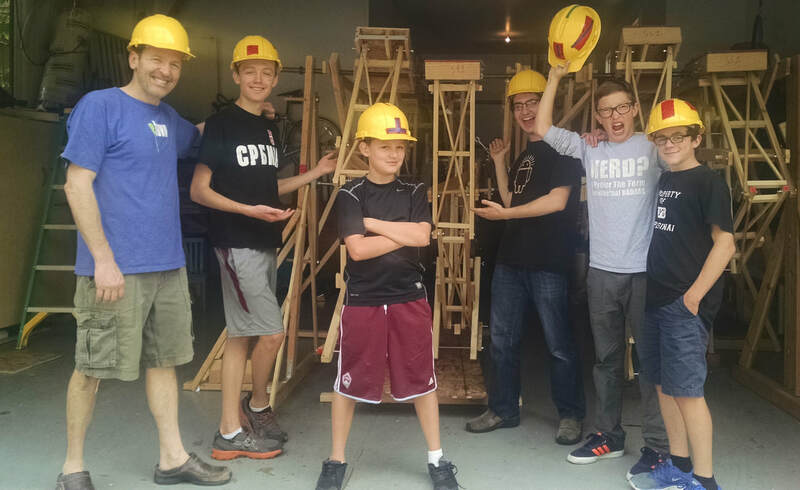 For example, the "heel" linkage's connection to the leg's inner beam works well at LEGO-scale with its high strength-to-weight ratios, but our 450 pound wooden TrotBot put a lot of stress on that leg section, and we had to reinforce it with a truss. ​The heel and toe linkages add mechanical complication and friction, increase the number of parts required, have inertia effects which can add to vibration problems at larger scales, etc. Even with 12 legs you would need to add feet, so maybe explore shock-absorbing feet, perhaps like the feet used by the Mondo Spider in the video below. Also, notice how Mondo's feet were designed to slide, which helps to smooth Klann's speed, and also makes tank-style turning feasible for large mechanical walkers - at least on smooth terrain. 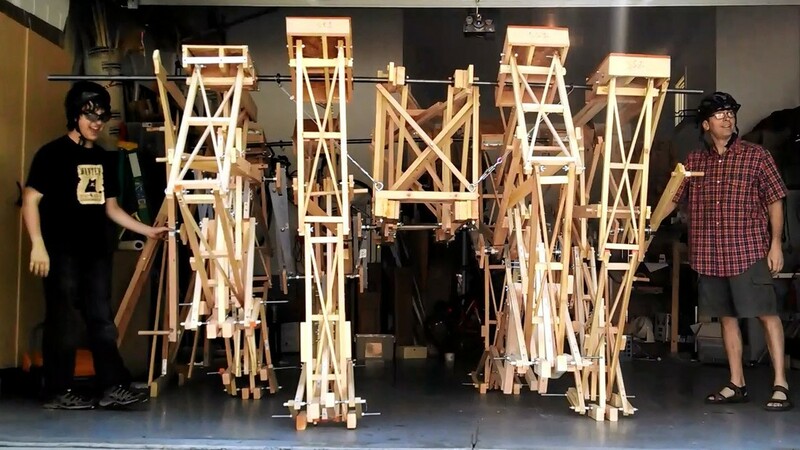 ​​Below are the bar lengths of the large-scale TrotBot we started building out of bamboo - which we never finished since bamboo's variable geometry can require a lot time to turn it into precision parts, plus the joints require reinforcing so that the bamboo doesn't split. Please note that the triangle's bottom right angle highlighted in pink is not 90 degrees, but is 109.475 degrees. 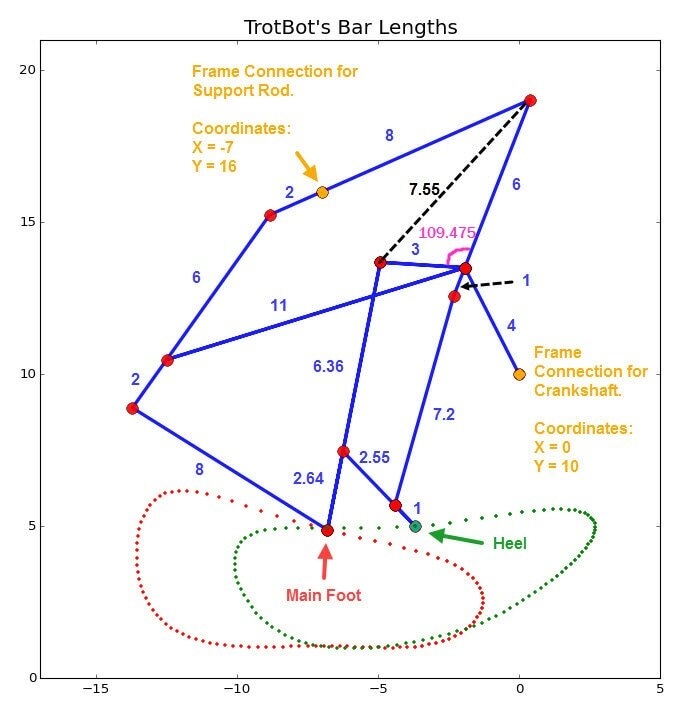 You can find more details on the linkage, as well as the dimensions for the retractable toes on TrotBot's Linkage Plans page.